In today’s technology-driven age, there seems to be a disconnect between how individuals communicate with each other and how businesses communicate with their customers. Can you guess what one of the biggest differences is? The answer is text messaging. If you’re like most people, the majority of your quick conversations with friends and family are via text message. With 98% of smartphone owners using text messages on a regular basis, it’s very surprising to see that only 14 percent of businesses regularly use text messaging to communicate to their customers. Not surprisingly, a recent survey revealed that nearly 90 percent of consumers want to communicate with businesses via text. Text messaging creates an opportunity for dealerships to share relevant information quickly with their customers. Communicating by text also differentiates dealerships by providing a direct two-way channel to drive added service upgrades, assist with sales increases and improve overall customer experiences. Here are two key questions that dealerships should consider when evaluating whether to include text messaging in their customer communications. When asked which communications channel they preferred to use when engaging with a business, an overwhelming majority of consumers surveyed cited a preference for text messaging over other methods like email or voice/phone interactions. Text messaging was seen as being both more relevant and timely than email. Respondents noted they only opened roughly 25 percent of the emails they received from businesses, versus opening 90 percent of their text messages received from businesses. Dealerships that still rely on email or voicemail to get time-sensitive information and offers to customers are falling behind and are not being heard. Consumers increasingly depend on and demand messaging services that let them interact with businesses in a fast and convenient manner. 2. What impact can text messaging have on my dealership? Sending appointment reminders by text can help cut down on no-show rates and late appointment cancellations, which can often have the single biggest effect on lost revenues. Not being able to adequately prepare for appointments coming in can also lead to staffing inefficiencies and overall operational performance challenges. Texting can improve customer satisfaction and overall service experience by providing accurate ETA windows and real-time updates and delivery notifications. Giving your customers a direct line to communicate with their service advisor will provide a level of transparency and trust that your customers are looking for. 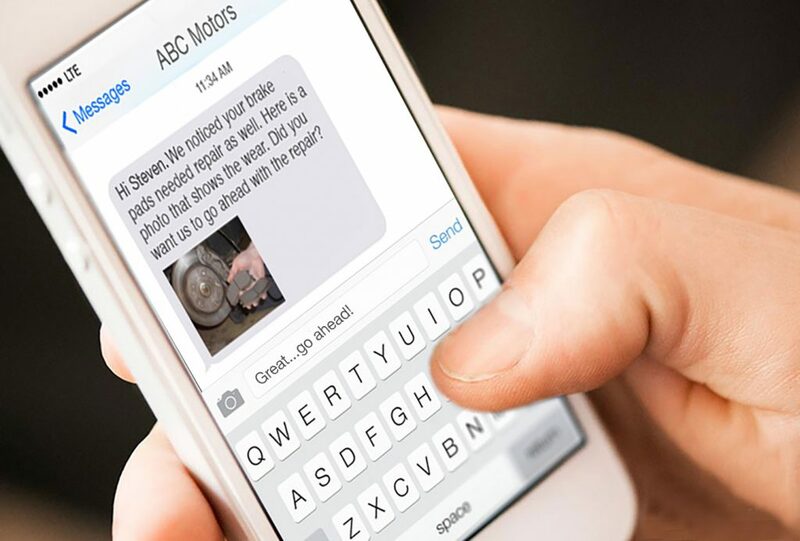 Providing images via text message can drastically increase your turn around time for repair authorization. People respond to visual elements, so being able to show what parts needs to be replaced or serviced far exceeds the impact of explaining it over the phone. Post service follow ups are a powerful way to harness immediate feedback from your customers. Dealerships can send messages or short survey questions and receive a higher response rate and respond to any customer concerns or problems that may come up in real-time. Dealerships of all sizes are beginning to see the benefits of incorporating text messaging into their communication services and are finding that the transition is not a painful or difficult process, but a rewarding one. Those choosing not to support text messaging are not listening to their current customers and closing the door on potential customers who are actively seeking engagement and an increased level of customer service. As a result, these dealerships are inconveniencing customers and ignoring opportunities to build their brands, as well as falling behind in keeping up with their competition. Find out more about autoTEXT by VenueVision and the benefits this powerful, centralized texting tool can provide to your Dealership.